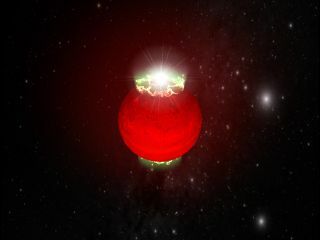 An artist's impression of auroras at the magnetic pole of a brown dwarf. Astronomers believe this phenomenon may account for the bright "radio flares" given off by dwarfs such as J1047+21. Failed stars can emit detectable radio waves at much cooler temperatures than previously expected, according to new research. The discovery could help astronomers understand how these so-called "brown dwarfs" generate a magnetic field. Some scientists think a faster rotation makes the magnetic field stronger. "We don’t really understand what [the magnetic fields] are shaped like, or whether they're steady, or come and go," said Peter Williams, an astronomer at the Harvard-Smithsonian Center for Astrophysics in Cambridge, Mass., and the lead author of a paper announcing the find submitted to Astrophysical Journal Letters. The new research is based on only two hours of observations of one brown dwarf star. However, Williams said much of the groundwork came from another science team that did a survey of brown dwarfs this summer. It was from this work that Williams' team selected its target: 2MASS J10475385+2124234, a brown dwarf more than 33 light-years away in the constellation Leo. The scientists turned their attention to the brown dwarf after looking at research from Pennsylvania State University searching for radio flares from several brown dwarfs. It isn't clear what causes these flares, Williams said, but they could be similar to auroras seen on Jupiter. While Earth auroras are caused by solar particles hitting the magnetosphere, Jupiter's lights are linked to its rapid rotation, among other factors. Since brown dwarfs are comparable in size to Jupiter, the brown dwarf flare mechanisms might arise similarly. J1047+21, as it's known in its short form, was first examined using the huge, fixed radio dish at Arecibo Observatory in Puerto Rico. Because that dish can't move, the Pennsylvania astronomers were forced to observe it for only two hours at a time. In several observations, they noted flares of radio activity. Williams' team at Harvard, intrigued by the find, wondered if the dwarf might give off radio waves in between the flares. They decided to use J1047+21 to test out the capabilities of the recently refurbished Karl G. Jansky Very Large Array (VLA) of telescopes. The $94-million project, completed in 2012, represented a big leap in capabilities for the 1980s-era array in New Mexico. Analog recorders were swapped out for digital, and the receivers inside the antennas were upgraded to make them at least 10 times more powerful. The researchers did not detect any radio flares — in contrast to what the Pennsylvania scientists found. They didn't really expect they would see the flares — "it would have been a lucky coincidence if we had," Williams said. A priority for further research, Williams said, would be to observe J1047+21 for a longer period than two hours to determine if there is a cycle for its flare activity. "We’ve been discovering brown dwarfs that are smaller and smaller, cooler and cooler, fainter and fainter," added Williams, whose research focuses on low-mass stars and brown dwarfs. This discovery, he said, was only possible due to the capabilities of the upgraded VLA. Williams therefore anticipated that the record could be shattered again soon. "There could be a lot more of this coming along," he said, adding that more observations in general "will help us learn more about the physics that drive these extremely faint objects."